DJ Dre was great! Professional, available and accommodating! Met DJ Dre at a bridal show and liked that he was affordable and easy going. He was extremely responsive and easy to work with throughout. Loved the portal- very easy to use, had a huge database of songs to choose from, and was easy to input all of our details on entrance song, first dance, etc. We worked with both DJ Dre ans DJ Cory ahead of time to finalize details. They were great and I could tell they really cared about making our day perfect! DJ Cory was our DJ the day of and did a fantastic job getting a lot of people on the dance floor! Would highly recommend! Thank you Vicky & Greg it was a pleasure working with you and I’m happy that my services were satisfying to you on your wedding day. DJ Dre went above and beyond. He kept our guests and ourselves dancing all night. He took into consideration our interests and played along with some funny announcements for our bridal party, per our request. Overall, everyone had a great time and we had many compliments on the DJ! Also, the photo booth was a hit and the scrapbook we received at the end, with pictures from throughout the reception, was awesome! ?? Thank you William House it was a pleasure working with you. Customer satisfaction and providing that professional service that you excepted was very Important to me. I can not recommend DJ Dre highly enough! He made our special day so wonderful and kept our dance floor busy all night long! He is wonderful and so easy to work with! Thank you Stacy & William It was a pleasure working with you and thank you for choosing DJ Dre Music and PhotoBooths to share on your Special wedding day. We used DJ Dre as or DJ and we also used his photo booth and he as amazing!! He made our wedding so much fun, he’s so nice and all of our guests loved him! So easy to talk to and get ahold of! Definitely going to be recommending him to my friends and should be recommended on wedding wire!!! Thank you Bethany & Austin it was a pleasure working with you and thank you for having DJ Dre Music and PhotoBooths for your Entertainment. A major concern of ours was making sure everyone was on the dance floor having fun and that definitely happened! DJ Dre kept us organized and worry free during the reception & the photobooth was awesome too! DJ Dre is the best. 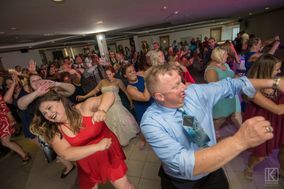 Both my sister and I had him DJ our weddings and we had a blast! Everyone had such a fun time and he somehow catered for an international crowd. No one could have done it better! Thank you Elizabeth it was a pleasure working with you and seeing you and your family again. Customer satisfaction is really important to me so thank you. So ill explain the process. Called the dj we met went over everything gave my deposit we paid in full early they use a website for almost all of the info needed which was really nice. They keep in contact they are so amazing with the communication and extremely knowledgable about everything. Week before met with dj in person he even came to my house which was very convenient! Day of they were the 1st people at the venue set up fast even the owner was there. The crew were these nicest most professional people I had ever worked with. Not to mention the service and products they bring are amazing. We had just a dj and the awesome photobooth. Going into my wedding this was the biggest unknown for us a dj after the wedding i can 100 percent say this was the best part/ value of the entire night. I highly recommend them. My husband and I got married in Buffalo, NY and being from Hamilton, ON, we didn't know any DJs in the area. We found DJ Dre at a vendor show and knew we didn't need to look for anyone else. His upbeat personality sold us and our instincts were right! DJ Dre was flexible with us as we didn't live in the country and made sure everything was in place for our wedding. His website so super easy to use as well! The night of our wedding, our guests kept telling us how much they loved the music and were equally impressed with the photo booth that DJ Dre also provided. Overall, it was an amazing experience working with him and our wedding couldn't have been better. Dre also was also very accommodating with our late end time which was much appreciated! DJ Dre was awesome, we had him as well as a live band entertain our guests during our reception! Every time it was his turn to run the dance floor he had everyone out of their seats dancing and having a great time. He was very easy to work with and was extremely accommodating to last minute changes and requests. Me and my husband highly recommend DJ Dre and he will definitely be our go-to should we ever need a DJ again. Thank you Jamillah for your review, it was a Pleasure to work with you and your husband on your wedding day. Customer satisfaction is what I aim for to Provide the Best Experience Possible. We are so happy we chose DJ Dre for our ceremony/wedding reception! He was easy to work with, attentive, and professional throughout the planning process. He did a wonderful job honoring our playlist and guest's requests while keeping the dance floor full! I highly recommend DJ Dre for your big day! Thank you Gina & Adam it was a pleasure to work with you and to see you and Adam on the Dance floor Enjoying Your Special Day and Good Music. DjDre Music was the best! Everyone loved him!! He was flexible when we had to meet with him. And He was very professional. You need to book him for your wedding or whatever event you havr. Us along with everyone in attendance were very satisfied with DJ Dre. He played everything had requested beforehand and also took request from everyone. I would highly recommend his services! Thank you Kenneth Gilmore it was a pleasure to meet you and work with you and to provide The Dj service for you. We could not have been happier with this DJ for our wedding! From the very first meeting until the very end! He was very patient, helpful, and understanding through the whole process! Communication was great! We even had a change of plans at the end of the night and he helped make it work! A wonderful guy and an amazing DJ! Thank you, DJ Dre! DJ Dre was AMAZING. He kept our guest dancing all night. We met with him twice to go over what we wanted out of a DJ and he hit it out of the park. All of our request was met! He also did a great job working under pressure. 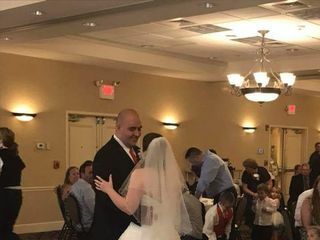 He was able to move his speakers in place so the dinning room could hear the music for the introduction of the wedding party! He was also able to get music for a polynesian group that my mother inlaw had as a surprise for the wedding! Overall an awesome DJ for any event! Super resillent! Thank you Puka and Cassandra it a pleasure to work with you and to be a part of your Special day. DJ Dre did an excellent job for our wedding. He was very professional to work with before the wedding. The day/night of the wedding went very smooth. Once the dance floor opened up he had it filled the whole night. Thank you Sean and Vera Puckhaber it Was a pleasure to work with you and to be a part of your special day!! DJ Dre was professional, intuitive with the music selection, and a pleasure to have at our party! Our guests commented frequently about how awesome the music was - thank you for making such a positive impact to our event!! DJ Dre & his staff were a pleasure to work with! He was so helpful throughout the planning process, quick to respond to emails, and was so enthusiastic during our reception! We are so thankful for the upbeat, fun, and welcoming atmosphere he helped us create! Thank you Kayla and Peter for your review, customer satisfaction is what we strive for. We highly recommend DJ Dre!!! He was very professional, attentive to detail and still great value. More importantly, he kept the party going all night!! He knew how to keep our guests on the dance floor. We also used his photobooth which our guests enjoyed. The photobooth gave amazing, high definition pictures- we loved being able to see our guests having fun all night and now have the pictures to remind us forever. Again, we absolutely recommend DJ Dre! Thank you Melissa & Christopher! We found DJ Dre when he did another friends wedding and he came highly recommended. He was very professional and responsive every step of the way. His website was very user friendly and helped greatly in the planning process. He also has a photo booth which was so fun! Thank you so much Charlynn and Cory it was a Pleasure to be your Dj and Photobooth Entertainment for you on your Special Day! !